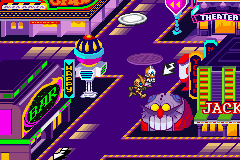 Night Babylon is the fourth overworld area visited in Sonic Battle for the Game Boy Advance. Central City's neon-lit nightlife district, Night Babylon is crammed full of stores, bars, and casinos, foremost amongst them being Rouge's very own den of iniquity, Club Rouge. The area also hides a not-so-cunningly-disguised entrance to one of Eggman's underground bases, Gimme Shelter. It does not, however, have the slightest thing to do with Babylon. First accessed in Rouge's episode, Night Babylon is where the bat brings Shadow after saving him from the Guard Robos in Gimme Shelter - perhaps the thief's only act of charity ever. The Ultimate Lifeform then spends most of the game tucked away inside Club Rouge, dreaming fevered dreams and babbling in his sleep. Rouge also retreats here to lay low after stealing Emerl from Amy in Emerald Town, and trains the robot up intending to turn him into an all-purpose thieving aid. Due to the non-linear nature of Sonic Battle's stages, other characters return to Night Babylon in their own episodes. Knuckles' story sees him and Emerl dismantle a veritable army of E-121 Phis and Guard Robos amidst Night Babylon's streets. Amy also (reluctantly) enters what she calls the "spooky" district when Emerl detects emerald shards here. The Club Rouge Battle Arena. There is only one battle arena for Night Babylon: Club Rouge. Although it's not strictly confined to the bat's personal establishment; all the casinos in town have the same fighting stage. The Club Rouge battleground is a medium-sized, square arena, with wall-like segments enclosing a central area with a raised platform. Predictably, Rouge herself uses this arena to train during Shadow and Emerl's episodes. This page was last edited on 13 September 2015, at 07:42.